When it comes to elite athletics, function trumps form. Of course, the two sometimes go hand-in-hand. Check out the 6 best bodies on display at the 2012 London Olympics! Olympic athletes don't view their bodies the same way you and I do. We marvel at chiseled abs, biceps, and shoulders. They focus on power, speed, and stamina. Over the past few months we've interviewed dozens of Olympic athletes from almost every sport, and if there's one thing we've learned about how they view their physiques, it's that function always trumps form. Of course, the two aren't mutually exclusive. Here, we break down the six best bodies we expect to see in the London 2012 Games. Allow us to present The Missile—Australia's secret weapon. Everyone wants to know how Magnussen, an athlete no one outside of Australia had heard of just over a year ago, has ascended to become a favorite to take gold in the 100m freestyle event in London. At last year's FINA World Championships, Magnussen took first in the men's 100m freestyle, while Team USA's Michael Phelps and Ryan Lochte won the 100m butterfly and 200m freestyle. 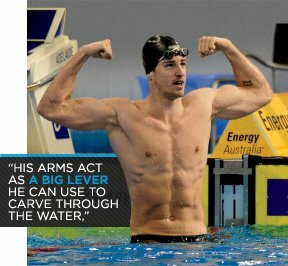 "His arms act as a big lever he can use to carve through the water," says Kevin Netto, Ph.D., a biomechanics lecturer at Australia's Deakin University. "In biomechanical terms, his body is about as perfect as you could get." Canada's 37-time senior diving champ makes his way to London for his fourth Olympics to secure the gold that has eluded him for the past 12 years. To get in the best shape of his life, Despatie has been following a rigorous, core-intensive workout. Six days a week he cranks out 1,000 crunches, followed by an hour of strength training, an hour of cycling, 20 minutes of trampoline work, and then 50 sets of pike-ups. Regardless of how he places, Despatie's physique is sure to make a splash. Built like a bomb shelter, Taymazov, a freestyle wrestler and Uzbekistan's most decorated Olympian, is ready for London. At the Sydney 2000 Olympic Games, Taymazov won silver in the 130-kilogram weight class to become the first Uzbek wrestler to win an Olympic medal. He subsequently cut weight and has since been an absolute juggernaut in the 120-kilogram weight class, where he dominated the past two Games, walking away from both with gold and becoming Uzbekistan's first multiple medalist in the process. Usain Bolt shouldn't be as fast as he is. It defies all logic. At 6'5" and 190 pounds, the Jamaican sprinter is taller and leaner than a sprinter should be. That didn't stop Bolt from establishing himself as the fastest man in history at the Beijing 2008 Olympics and redefining our collective opinion of what a track star should look like. 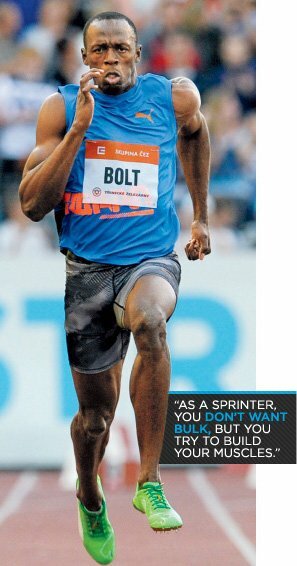 Bolt has a great overall physique, but when he's thundering down the track it's hard to ignore his incredibly well-developed legs. In between regular sprint workouts, Bolt makes his way into the weight room three days a week to pound out high-volume, moderate weight sets of lowerbody lifts like squats and leg extensions. "As a sprinter, you don't want bulk, but you try to build your muscles," he says. "When you hit a stage, you kind of tone it up." Hardee, 28, is the current decathlon world champion and one of three American decathletes poised to medal in London. "Mental preparation is a big part of what gives me an edge," he says. Hardee's physical preparation, however, might be more obvious, like his muscular back—his physique's most notable feature. Lifting 20 to 40 hours a week will do that to you. "The weight room is an integral part in how we train and how we develop strength and power," says Hardee, who incorporates rowing into his training to build endurance and power. "We'll do tens of thousands of meters on the rowing machine," he says. Naturally, Hardee's diet is also a contributing factor to his muscle gains, and his rules are simple. "I listen to my body and eat when I'm hungry," he says. "The more organic and natural I eat, the better I perform." seen a player like Nadal—his game, nor his physique. doesn't train like one. His monstrous shoulders are mostly the result of his aggressive, all-out style of play—notice how his arm flies up after every explosive stroke—but also an intense open-water swimming regimen that uses the ocean's waves for natural resistance.